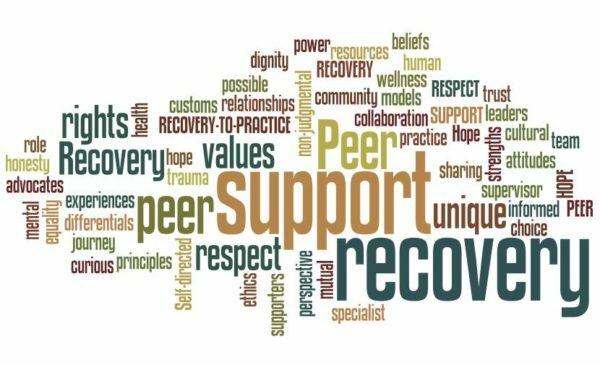 The power of peer to peer support is often overlooked as a vital component in a person’s recovery process. The Substance Abuse and Mental Health Services Administration (SAMHSA) defines peer support as “services designed and delivered by people who have experienced both substance abuse and recovery.” By this definition, when a peer mentor says ‘I understand how you’re feeling,’ they genuinely mean it. They mean it because they’ve been in the other persons’ shoes, they’ve likely experienced relapse and detox, and some have even served time behind bars. Because of this experience, peer support is able to extend passed the clinical reach of treatment by sending a powerful message of HOPE to those new to recovery. Hope is often lost by those battling substance use and/or co-occurring mental disorders because they’ve gotten to the point where they must admit they’ve “become powerless to their disease.” The first of the 12 Steps…admit you’re powerless, saying it is one thing, but actually meaning it opens a door to a fight that people shouldn’t have to face alone. Peer support focuses on four main areas, which of which are important to the success of the relationship between the two: emotional, informational, instrumental, and affiliation. Emotional support can come in the form of mentoring or support groups. Peer recovery specialists work to encourage individuals through empathy, boosting self-esteem and creating an atmosphere of mutuality. They usually begin working with people at their lowest and help to empower them. Informational support may be providing training in life and vocational skills or simply offering general knowledge about pathways to recovery. This is a key service area for peer support. People often have no clue how to navigate their recovery. Simply put, people come with a lot of questions and peer mentors are there to provide guidance. Without answers, feelings of helplessness and fear of change may creep in, devastating a person’s journey to recovery before it even had a chance to begin. Instrumental services includes helping individuals to access community health and social services or teaching them to navigate different systems. This may also include helping them apply for various benefits available that can help meet their basic needs. Fulfilling basic needs, such as food and shelter allows them to focus on their recovery. Lastly, providing affiliation creates a sense of belonging within the individual. Addiction is a disease of isolation and those individuals in early recovery are often in the process of rebuilding healthy social networks and family relations, so providing this strong sense of connection early in a person’s recovery is of the utmost importance. Being labeled an addict, a junkie and being considered a societal outcast creates an invisible scar that may take years to heal. Having someone else’s acceptance is often the first step in that healing process. The benefits of peer support are undeniable. Individuals who have received peer to peer support report benefits, such as helping them to remain in recovery. Through peer support they’ve also discovered a safe place to socialize where they were able to learn and practice new social skills. A genuine and mutual sharing atmosphere is created in which problem solving could ensue. And what’s even more amazing is people reach a point where they feel the passion to help others as they have been helped. Many organizations in Richmond now utilize this integral component in their treatment programs including The Healing Place, McShin, Rams in Recovery, SAARA and of course, REAL LIFE, among others. Intentional peer support creates such a wonderfully unique relationship, people feel they belong and form such special connections. It is this feeling of being connected to someone and something that keeps people coming back and makes this such an effective recovery tool. The power of peer support is REAL and absolutely necessary in a person’s recovery journey! No one should ever be alone in this process and they don’t have to be when there are plenty of men and women in recovery who are willing to help others!